Training your Goldfish to come to you at feeding time is one of the pleasures of keeping them. It is very frustrating when all your fish disappearing from sight as soon as you approach their pond. We all know Goldfish love their food. We can use this fact to train them to come to the side of the pond at feeding time. 2. It’s handy to be able to observe pond fish at close quarters to check for illnesses rather than finding fish floating dead on the surface is the first sign of a problem. Although I am concentrating on training pond fish, the same techniques apply for aquarium fish except you don’t need to attract their attention in some way as they will have already seen you. If your fish already come to the front of the aquarium at feeding time, biting at the glass with the feed me, feed me look in their eyes, they are already half trained. Clear Water. If Goldfish can’t see you clearly because their water is cloudy, only the very bravest will show any interest in being trained. Even when they are fully trained, as my fish are, if their water goes cloudy, they are less inclined to take food from my hand. Suitable food. I find gel foods are the easiest to use. I can stick small pieces on to the end of my finger, and the fish pick it off. Flake foods dissolve into powder too quickly, and pellets require the fish to swim into your submerged hand, unless you feed one pellet at a time. Pick a Warm Season. The best time to start training your fish is when they are hungriest, so don’t bother during winter. Late spring, summer if it isn’t too hot and early autumn are the best times. As I mentioned earlier, Goldfish love their food, so you are going to restrict their food intake for a short period. This heightens their senses and makes them more aware of when and where they get fed. Follow these steps precisely for two weeks and your fish will be trained. Step one. Tap the side of the pond a couple of times. You want them to associate the vibrations they feel with food. Step two. Feed a small amount of food, much less then you normally would. Feed the food in the same place and at approximately the same time every day. After about a week, depending on how much human contact your fish have had, you will notice the fish gathering at the spot where you are feeding them. Step three. Slightly submerge your hand into the water and release the food into the water. 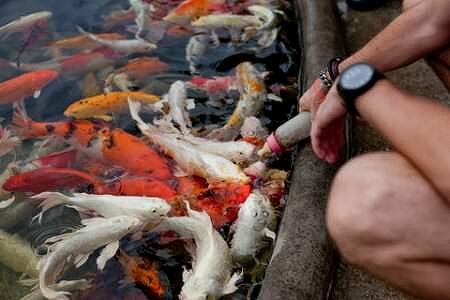 Initially the fish won’t be interested in the food until you remove your hand. Keep repeating this until the braver fish start getting closer to your hand while it is in the water as they start to associate your hand with food. Keep holding on to the food for longer periods before releasing it. Make it obvious to any fish that get close to your hand that your hand is the food source by releasing it as they are looking at your hand. Step four. Hold on to the food. At some stage, one of the fish will take a quick bite and dash back to the depths with its prize. Keep repeating steps three and four until all the fish are eating from your hand. You will notice Goldfish do have different temperaments. It is usually the biggest fish that will take the first bite, and keep coming back for more, and the most timid will only take one mouthful and not come back. You can start to increase food back to normal levels once you are happy the majority are feeding from your hand. The more fish you are training, the faster they become trained. Clothing color doesn’t seem to matter. I can wear pastel colors or hi-viz safety gear and it makes no difference, even though Goldfish see more colors than we do. Goldfish being short sighted is a myth. My fish will spot me while I am meters away and will follow me as I move around their pond, which brings me to my final point, the down side of training your fish. If it is feeding time, your Goldfish will congregate at the spot where you normally feed them. They aren’t the greatest time keepers and they will start congregating up to an hour before their usual feed time. If their pond isn’t covered, the shadow they see may not be you, but the neighbors cat, or a predatory bird. Brightly colored fish swimming close to the surface that aren’t timid are easy targets.